On Sunday the 11th of January 2015 at 11.00am in U.L, we are hoping to break the world record for a relay marathon of 2hrs 10 min 50 secs. We need 105 runners to each run 1 x 400m lap before handing over the baton to the next runner. 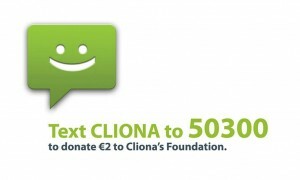 Each runner will be sponsored and all proceeds will go to Cliona’s Foundation; helping the families of sick children. We will need help in getting 105 runners so please share this post and anyone interested in participating or helping on the day please contact Derek Casey through the official event Facebook page or 086 0693600. Derek Casey. There will be a prize for 1st, 2nd and 3rd fastest laps for both male and female.